I have completed my study of Biodynamic Craniosacral therapy with Roger Gilchrest, MA, RPE, RCST®, and Mimi Ikle-Khalsa, RCST®, LMT. I am now an RCST®! Allows time for your body to settle and integrate any shifts which occurred during the session. This work is done on a massage table with loose and comfortable clothing remaining on. The table warmer and blankets are always available. The majority of the touch is extremely light, like a cork floating on water and can be done from any area of the body. You will mostly be lying in your back or possibly your side, but there are times (infrequently) we may work with you face down. In daily life, everyone copes with many levels of stress and trauma. Our ability to function optimally may be compromised as we are challenged to maintain health. Often, this leads to distress, discomfort and disease. Biodynamic Craniosacral Therapy assists the body’s healing intelligence in restoring health and balance. Where does Biodynamic Craniosacral Therapy come from? 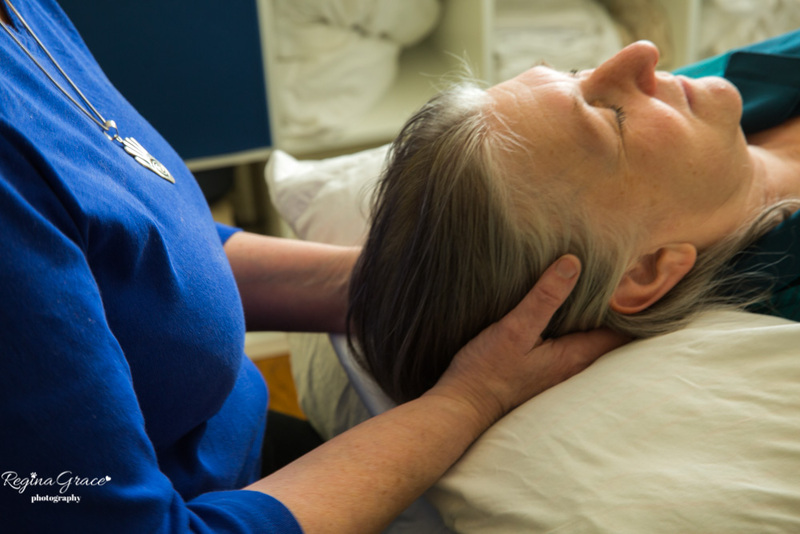 The craniosacral concept was discovered by osteopathic physician William Garner Sutherland in 1901. He was initially inspired when he noticed that the edges of the cranial bones were beveled as if created for a respiratory-like motion. This began a long exploration of what he termed “The Primary Respiratory System.” After Sutherland discovered that the bones of the cranium were made to move, he explored what caused this movement. He began to focus on the rhythmic inhalation and exhalation action of the cerebrospinal fluid surrounding the brain and spinal cord. This pattern is responsible for the synchronous movement of the bones and membranes of the head (cranium) and pelvis (including the sacrum)thus the term craniosacral. Over the next 40 years he explored these biomechanical relationships. In 1948, Sutherland was inspired again when he observed a condition in a client correcting itself using the forces from within the client’s body. He termed this healing intelligence the”Breath of Life.” For the last six years of his life, he worked with the idea of this inherent self-healing system. No longer was he just looking at the movement of the structures, but he was witnessing the intelligence of the fluid that moves the structures. This last development has given rise to the biodynamic approach to craniosacral therapy. Following his death, his principle student Dr. Rollin Becker made stillness and silence essential skills for practicing this emerging model known as Biodynamic Craniosacral Therapy. A session begins with conversation about health issues or concerns. Treatment is comprised of gentle, listening touch as you lie fully clothed on a massage table. Using stillness and silence, practitioner and client together facilitate the emergence of the inherent healing forces. This leads to stress relief, greater comfort and enhanced health. A client can have a variety of experiences, each unique, from person to person, and session to session. Craniosacral Therapy is suitable for all ages, infants and children as well as adults. It is beneficial for people looking for resilience; an increased vitality; recovery from accidents, traumas, surgeries, and other injuries. People who participate in this journey benefit through greater awareness of their inherent health.